There you are! And here, we continue our saga of the Animatron Editor Main Menu with part 6! Let us discover the process of how to import your own content into the editor with the handy Import Feature. 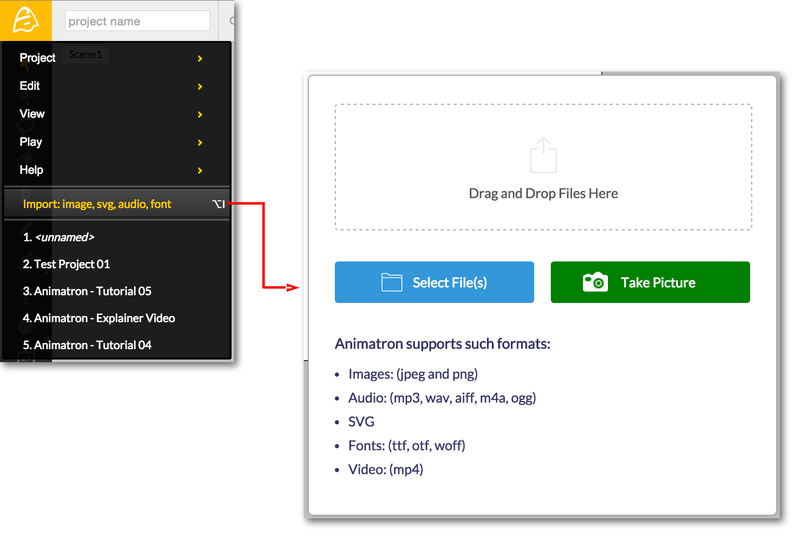 The Import Feature is a great tool that allows you to import Images, Audio, Video and even Fonts, into your project. You are able to drag-and-drop your files from your own desktop folders, directly into the Import Feature Pop-up Window, designated by the area within the dashed lines. Alternatively, you can directly select files from your computer with the Select File(s) option. Only specified file formats are supported. For Images, JPEG, PNG, and SVG files are acceptable. For Audio, MP3, WAV, AIFF, M4A, and OGG file formats are acceptable. For Video, MP4 is currently the only acceptable file format. For Fonts, TTF, OTF, and WOFF are the supported file formats. If you wish to directly import an image with your web camera, select the option to Take Picture. Say Cheese! Wrapping up this section, let us take a quick glimpse at the Recent Projects List, towards the bottom of the Main Menu. The Recent Projects List is used to quickly access projects that you have recently opened, saved or downloaded with the currently logged-in User Account. 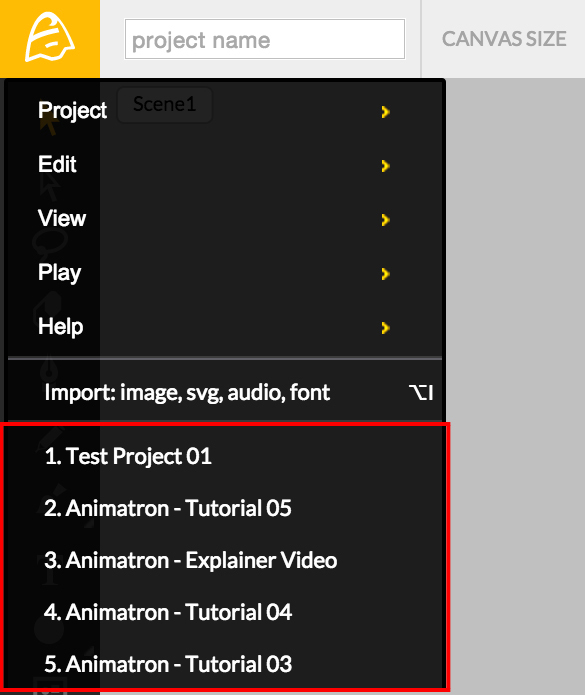 Simply, the project name(s) are listed at the bottom of the Main Menu drop-down, revealing up to 5 recently opened projects. So, we’ve finally gotten through the Main Menu! But we’re nowhere near unlocking the mysteries of the Animatron Editor Workspace. Moving forward, we will jump over to the Toolbar to see our Editor’s array of rich drawing and editing tools!